As I worked Tally on the lunge today, watching her move in or out, changing her tempo based upon my movements, I started to ponder a video I recently saw. (I’m an introvert – pondering things is what I do.) The video, posted on a Facebook group, introduced a member’s approach to groundwork. At the risk of offending a couple of Facebook friends who may read this, the video was filled with myths invented in the name of explaining the trainer’s techniques. In a brilliant blog I’ve read more than once, this was called “Peter Pan Horsemanship“. Since I started this blog in part to help others understand our equine partners better, I thought I would (without naming anyone) take on some of the mythology I saw in the video in question. They are rather common misconceptions, so there is value even without seeing the video. First myth: Where you stand matters. This is one you hear frequently with natural horsemanship followers – step behind and the horse will move on, step in front and the horse will slow or stop. Interestingly, in the video in question, the presenter gave the opposite information. Her contention is that if you stand toward the back, with your navel pointed toward the hind leg, the horse will engage, balance and slow; if you step toward the front the horse will rush and get out of balance. Reality check: Where you stand only matters if you’ve trained the horse to react to it. The truth is, horses have no natural inclination to move away or stop based upon where you stand. I watched, last year, as a Natural Horsemanship “guru” confidently spoke of the “instinctive” responses I mentioned above – only to then have the demonstration horse nearly run her down as she stepped in front to show how it would stop. I’ve watched horses not even move, as someone confidently steps toward the rear to “push” them on (I even once stepped into the behind of a safe horse, to prove the point I’m making here). A good way to get kicked, if you aren’t careful! With reference to the video, and her assertion that stepping to the rear collected, and to the front caused clattering – aside from flying in the face of “common wisdom”, it too is simply a learned response. (And the idea that where your navel points matters at all is just laughable.) The truth is, horses learn to do what works. If you step behind and pressure or pester them, and then stop when they move away, then they will learn to move when you step behind. If instead, as I saw in the video, you step behind and pull on their nose, then relax when they slow down, then they will learn to slow down when you step behind. According to the video in question, this position would have Nash rushing around – yet he looks clearly relaxed. Second myth: We can replicate equine body language. The first myth, about body placement, is often supported by the further mythology that it is based upon observations of “how dominant horses move other horses”. In this mythology, we are somehow replicating “natural” body language that “all horses understand”. In the video, the presenter attributed her affect on the rear of the horse to the affect the stallion has on the herd; and her affect on the front of the horse to the affect the boss mare has. Reality check 1: Horses reactions to herd mates are not instinctive. First, there is no such thing as dominant horses moving other horses. Studies continue to show that decisions to move, within a herd, are made by any member, and that others choose to follow – they are not directed. Second, a horse moving away from the gesture of another is actually a learned behavior and not instinctive. If you have raised foals, and are a keen observer, you have seen many instances where they completely ignore all the “clear signs” from an adult, only to get bitten or kicked at. Being rapid learners, they soon figure out what the warning signs are, and will quickly begin to avoid the follow-up actions. Reality check 2: We aren’t horses! Even if we conceded that horses have instinctive ways of responding to each other, we are not, nor will we ever be horses! We do not look like horses, we cannot move like horses. Horses know we are not other horses – we should prove that we are at least as wise. The horse human relationship will never be a horse-horse relationship. As I pointed out above, horses will do whatever works. Approach them the way that you want, and provide relief or confirmation when they respond as you intend, and it won’t really matter if you want to teach your horse to canter if you stand on your head! Point of agreement: Body language is important in training horses. Horses are far more sensitive to body language than humans could ever hope to be. This makes body language a subtle and powerful tool in training. Unfortunately, the body language that truly matters is that which is controlled by your emotions. If you approach a horse in a hesitant or fearful way, it will have a negative effect on the interaction. In spite of what many will tell you, this will not be because the horse sees you as a wimp he can now dominate. Other than a stallion trying to beat another for a group of mares, horses have no real ambition to dominate anyone! No, your nervous body language is simply an indication that something is wrong. Prey animals are highly sensitive to any indication that something is wrong – it might mean their life if they are not attentive. So, when you act hesitant, they will be tuned for just what has made you nervous. 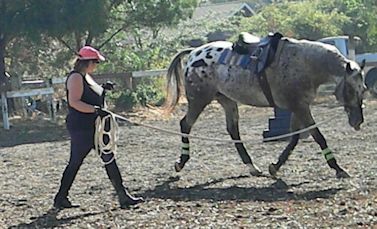 Some will tell you to take a confident posture around your horse (usually to prove your “dominance”). This can actually work in some situations – actors use it often. Act angry, and soon you may actually feel angry. The trouble with trying this around a horse is that I’ve seen many who start out adopting a confident posture, until the horse swishes its tail and they suddenly crumble again. Rather than try to fake it, step back into situations that are more comfortable for you. If you are comfortable leading your horse, but not when they’re loose, then why try round pen training? Find the “common ground” where the relationship works, until you are confident in trying things that might have previously made you nervous. It’s a relationship – it has to work for both of you! Final advice: Avoid mythology! Although I agreed with some of the principles being explained in the video, the mythology discredited it, especially when the images did not match the narrative. The mythology invented around many training methods, especially when they claim to be using the horse’s own “language”, obscure what is actually going on, and muddy the waters for those attempting to learn. The reality is that horses learn much the way that we do – except that they excel at trial and error learning, surpassing our own speed at it. There have been no “magic” training methods invented, and nothing seen today has been invented by anyone within the past century. I venture to say that all training methods were probably invented millennia ago, and just replicate themselves in each new generation. All of them work the same way – we ask for something, and a correct reaction is marked with either a reward or a cessation of the “ask”. Use whatever method works for you, and is humane – but let’s lose the mythology! This entry was posted in Thinking Out Loud and tagged "Natural" Horsemanship, body language, communication, groundwork, horse and rider partnership, Horse training, lungeing, reality check, relationships, training myths. Bookmark the permalink.